See the latest updates on Mark Carver's wait for Judge Christopher Bragg to render a decision on the April 2-12, 2019, hearing @FreeMarkCarver. Numerous news outlets have reported that the judge announced he will begin work on his ruling immediately but that there is so much material to consider that it will take a few weeks and that he will issue a judgement by June 1 before he takes his planned retirement on July 31. See our suicide reenactment video on YouTube and other website tabs to learn about this innocence case. First, Yarmolenko attempted to drive her car underwater but crashed on the riverbank. Then, she tried to drown herself in the river but was unable to do so without an attached weight since natural reflexes brought her up for air. Finally, she applied ligatures around her neck. It is possible she used her car keys to cut a ribbon loose from a bag found in the back seat of her car, shredding the ends of the ribbon. The keys were found on the ground next to the car. The suicide theory proposes that Yarmolenko may have then continued her attempts by tying three ligatures around her neck, the ribbon, a drawstring taken from her hoodie and a bungee cord similar to another one in the trunk of her car. Attorney David Phillips had planned to base his defense for Neal Cassada on the evidence for suicide and was disappointed that Cassada died before trial. Most of the suicide evidence went unused during Mark Carver's trial which was led by attorney Brent Ratchford, who at the time did not believe suicide had occurred. Phillips assisted Ratchford for Carver's trial and presented the suicide theory during closing arguments, but the closing arguments were not included in the trial transcript, so public records of the suicide defense are limited to news reports from the trial. Five years after Carver's trial, Ratchford told The Charlotte Observer, "I don't know what happened. I don't know who killed her. But I know it wasn't Mark. I know it wasn't Neal." The North Carolina Center on Actual Innocence accepted the case in 2013. NCCAI Executive Director Ms. Chris Mumma stated to WBTV in February 2016 (quote begins at 21:20), "The suicide was brought up kind of in passing at the trial. That's not the avenue that we're looking at. . . . I'm working on determining and proving whether Mark Carver is innocent. Mr. Cassada is deceased. Mark Carver is in prison, and I believe there is evidence that will definitively prove his innocence." Members of the media, public and legal community generally agree that Mark Carver's conviction is questionable, but disagreement is sharp over whether or not Yarmolenko may have committed suicide. The reasons against suicide usually center around the benevolent side of Yarmolenko's personality and the fact that she was found with multiple ligatures around her neck. Anyone familiar with suicidal risk factors or suicidal strangulation research knows that multiple ligatures are in fact a common finding in suicidal strangulation and that people at risk for suicide may display varying warning signs. Yarmolenko's life had a troubled side, including depression and repeated suicide attempts as a teenager, yet the flawless reports of her life that have emerged in the media continue to overshadow this case. While the author of this website cares about the lives of all those touched by this tragedy, including the surviving members of the Yarmolenko family, she also cares about the lives destroyed by wrongful conviction and therefore feels the truth about the suicide-related evidence in this case should be known. Consider how suicide offers a logical explanation for how Yarmolenko died while murder theories conflict with the total picture of evidence and require several unlikely events to have all occurred within a short time frame. What caused the patch of petechia (small, red spots caused by bleeding into the skin) located on Yarmolenko's right thigh? The prosecution during Carver's trial theorized this was created when someone sat on top of her. The small, triangular area appears more consistent with injury caused by sharp impact with the steering wheel or center console during the car crash. If no one was steering the car, then how did it travel a direct path? Dirt mounds, dumped from nearby construction, were scattered on the embankment, yet broken vegetation showed the car corrected toward a straight path each time it started to veer. By the time the car reached the river, it was still traveling in the precise center of the clearing. Where was Yarmolenko? The trunk was filled with gear, providing little room for her to have been forced into the trunk space alive. If we assume for a moment that Yarmolenko was pursued yet unable to drive toward the direction of safety, then why was her body found only a few feet from her car? The distance down the embankment was far enough to have provided a lead for an escape attempt over anyone else following on foot. Alternately, why didn't she lock the car and use her cell phone to call for help? No such call was recorded. Was Yarmolenko separated from her car and killed after the attempted concealment of the car? The close proximity of Yarmolenko's body to the car makes this unlikely. How did Yarmolenko become wet? Her hair and clothes were wet even though her body was found on dry ground. No footprints were recorded as having been found at the river's edge, which might have been expected if she had struggled with an attacker in the water. Had an attacker chased her into the river, he could have killed her by drowning much more easily than the manner in which she was found, with three ligatures intricately tied. Mark Carver's family claims that police witnessed his clothing and shoes to be dry at the same time that Yarmolenko's body was wet, and James Beatty who was with Carver at the riverbank confirmed this observation to The Charlotte Observer. Yarmolenko grasped brush from the spot where her body lay, showing she was alive when she came to her final resting place, meaning submersion happened before her death. It is apparent that the first ligature, the ribbon, was dry which means the ligatures were applied after she became wet (trial transcript, March 17, 2011, page 331). The suicide theory proposes that Yarmolenko intended to drown herself after her attempt to drive her car into the river failed. Natural reflexes make self-drowning without an attached weight difficult because we instinctively come up for air. A small scrape on Yarmolenko's index finger may have come during the process of using her keys to cut the ribbon used for the first ligature or from brush or tree limbs on the ground and in the water. Yarmolenko's 35mm film camera was found in the trunk of her car with no film in it and the counter advanced to two exposures. During closing arguments in Carver's trial, the prosecution theorized that those two snapshots were the motivation for Yarmolenko's killer to attack and that the killer must have removed the film to hide what it contained. However, the instructor for the photography class in which Yarmolenko was enrolled was quoted in a Gaston Gazette article saying that film must have been removed first and then the shutter button pressed afterward, since removal of film re-sets the counter to zero. Three other experienced 35mm photographers confirmed to the author of this site that the counter is zeroed every time the back cover of a 35mm camera is opened to remove film, and this author has access to a 35mm camera which she has viewed operating in this manner. Had any killer wanted to eliminate evidence of photos, he would probably have just taken the camera. Because the camera was found in the trunk, it is likely that the camera was never used at the scene. This theory is confirmed by the fact that no DNA or fingerprints were found on the camera, not even Yarmolenko's own. No sexual assault or robbery took place, which leaves question of a motive. Carver's and Cassada's fishing spot was obscured by trees, preventing them from seeing her arriving. 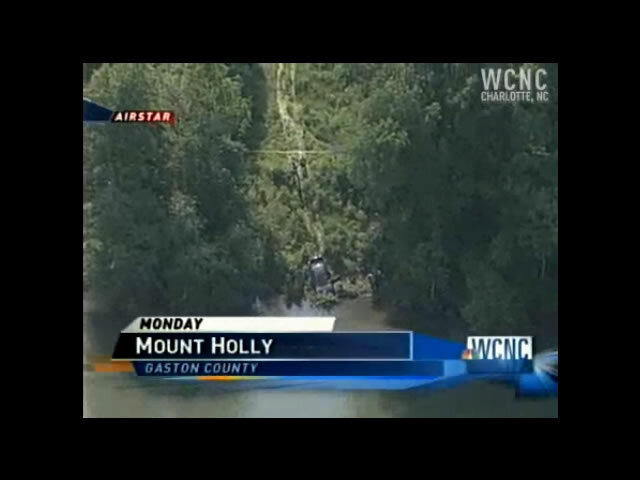 No footprints or tire tracks were recorded that linked the fishermen to the scene. In addition to an unclear motive, rumors exist that the jetskiers who found Yarmolenko's body privately admitted to having seen Yarmolenko splashing around in the water alone prior to her death. They have denied it to media when asked. See our timeline and scene findings page for more information about the jetskiers and their conflicting testimonies on the witness stand. "I didn't actually talk with first responders. I only spoke with a boater that was on the river near the scene as I canoed. This boater had spoken to first responders and he said they told him it was a suicide." The Charlotte Observer published in Chapter 2 of its April 2016 report, "Ira’s brother also heard 'a little bit of conversation' about suicide from investigators." It is interesting that Cloyd, Carver and other construction workers in the area all claimed to have heard the male jetskier yelling for help but never said a word about hearing a "commotion" prior to that time as prosecutors claimed there should have been. It could have been that Yarmolenko's death was a silent suicide except for the car crash. Cassada and Carver both mentioned having heard a "scraping" sound which they thought was a tractor scraping the road given the amount of construction taking place at the top of the embankment. At a visitation Saturday morning mourners quietly sobbed in front of Yarmolenko's casket, where she laid with her hands folded on top of her yellow sleeveless blouse. About 200 gathered for her burial. An original defense case worker answered "yes" when questioned via phone by the author of this site about a rumor that Yarmolenko's cell phone records showed an internet search for "suicide" the morning of the day of her death. Four other people familiar with the investigation claimed to have known about this, as well. The author of this site has been unable to obtain documentation showing this, neither was it mentioned during Carver's trial. Phone records show Yarmolenko placed dozens if not hundreds of cell phone calls to friends during the weekend prior to her death. It is typical for people who are planning a suicide attempt to reconnect with friends as a way of saying goodbye. This was suggested by Carver's defense during closing arguments as a reason for Yarmolenko's visit on the morning of her death to the coffee shop where she previously worked to visit with her former co-workers and leave a gift for her former boss. Several rumors have circulated that Yarmolenko dealt with anxiety. Someone who befriended Yarmolenko during her summer working in Alaska in 2007 emailed the author of this website to say that Yarmolenko had asked this friend to sell her prescription Xanax, an anti-anxiety medication. Another source claims Yarmolenko was worried about her grades in college. Yarmolenko's brother Pavel told media after her death that she had been a good student. Rumors exist that pregnancy may have been a concern several weeks prior to her death. There is a rumor that Yarmolenko was raped as a child in Ukraine and that this tragedy formed the basis of the family's plans to immigrate to the United States. Yarmolenko's brother was quoted by WRAL on May 12, 2008, "Pavel, 25, a graduate student at Duke University, said his family moved from Ukraine in the 1990s because of religious persecution." However, this author has not seen any references to Yarmolenko's having been involved in religious activity after her move to the United States aside from one news article mentioning she stayed after a campus meeting one night to ask questions of a man who had been a guest speaker about the Bible. Eli Kaiser, a Jewish college friend of Yarmolenko's, wrote, "Ira never seemed to be a girl who would talk about G-d, or the Bible much, BUT, whenever I brought it up to her, she always seemed eager to know more, and always seemed happy to see me talk about something that I loved so much and was so passionate about." Whether or not Yarmolenko was raped as a child or experienced long-term effects of such abuse into adulthood as is common among survivors in similar circumstances, a source with access to case records told the author of this website that documentation is on file showing that for whatever the reason, Yarmolenko had been treated by a psychiatrist at behavioral therapy clinic in Monroe, North Carolina, a thirty-minute drive to the southeast of The University of North Carolina Charlotte during the time she was a student there. You should know that she did attempt suicide more than once when she was in high school. She was a very sad person, something she quickly learned to cover up. Before her final and last suicide attempt she had wrote me an email. This email was written a few days before and it said she did not know what she wanted anymore and she felt like a bad person. It was along those lines, nothing that was out of the ordinary for her because she was a very mopey person but now that I think about it maybe it did mean something. Prior to Yarmolenko's death, her boyfriend of three years broke up with her. Three separate sources have claimed Yarmolenko cheated on this boyfriend, and one of those sources said the cheating included a bisexual relationship with another girl. On May 7, 2008, Adam Hamrick wrote that Yarmolenko's boyfriend told him at the end of the spring 2008 college semester that he wanted to try and work things out with her over the summer. Several people interviewed by investigators claimed Yarmolenko was bisexual - an entire folder is dedicated to this among case records - perhaps one reason friends remembered her as a social justice advocate according to The Charlotte Observer but also one reason she may have been at risk for suicide according to some studies (see References at the bottom of this page). One online forum claims that Yarmolenko was openly bisexual and served as the president of her high school's Gay-Straight Alliance (GSA), a student-run club. At 20 years of age, Yarmolenko was underage to purchase alcohol, but an alcohol bottle was found in her car at the scene of her death along with a cup of coffee. Some of Yarmolenko's poetry published after her death refers to death and dark subjects, which in itself may be typical for a teenager, however, this author is aware of additional personal writings of Yarmolenko which are part of case files but which have not yet been made public that bring into question the possibility of a non-typical dark side to her mental health. Elizabeth Leland interviewed Yarmolenko's brother Pavel Yarmolenko for her series in The Charlotte Observer. During that interview he declined knowing about any of the hearsay points listed above. “Do you know of any reason why she might have killed herself?” I ask. A friend of the Yarmolenko family wrote the author of this website on November 9, 2013, ". . . I never knew exactly why she attempted suicide before but there were a few rumors that she had been raped in the Ukraine and that's why they moved. I am not sure, it was a very sensitive subject that does not get brought up. I barley see the family, but when I do there is no mention of Ira or the suicide findings." 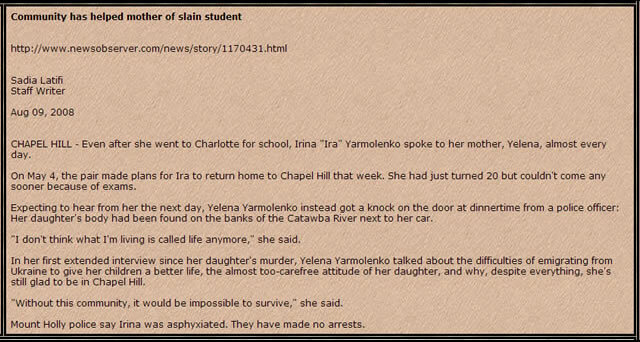 Yarmolenko's family claimed she had planned to live with them when she returned to Chapel Hill. However, the author of this website was told that someone who claimed to have known Yarmolenko said that Yarmolenko had told her she would kill herself before going back to live with her parents and be under their rules. The author of this website personally listened to a recording of a female friend who left a cheery message on Yarmolenko's voicemail within hours of Yarmolenko's death asking if Yarmolenko had decided yet where to live in Chapel Hill. The ligatures were still in place when found with the hands unrestrained. Ira Yarmolenko was right-handed, and the knots in the hoodie drawstring were on the right side of her neck, consistent with having been tied by her hands. Cassada and Carver were also both right-handed, which means the side of the knots would have been reversed if they had been standing in front of her. Multiple ligatures were used, all of which were personal items. Absence of major injuries and internal bleeding in Yarmolenko's neck point to suicide rather than murder. It seems strange that a killer would have taken the time to cut a ribbon and tie a bow and multiple knots, especially if Yarmolenko was fighting against him. An attacker could have strangled her more quickly by hand or by holding her underwater. Carver's jury had to overlook contradictions in the prosecution's theory in order to reach a guilty verdict. The prosecution could not give an explanation for how Yarmolenko became wet or how she had died. The timeline they presented required Yarmolenko to be unconscious from the ligatures at the top of the embankment even though evidence placed the sequence of ligature application as occurring after the crash and after submersion due to Yarmolenko's hand grasping brush where she lay and the fact that the ribbon used as the first ligature was dry. Yarmolenko's hands were found unrestrained. Had she indeed revived after an earlier attack, she could have removed the ligatures herself. The prosecution theorized that the killers put Yarmolenko's car into neutral and pushed it down the embankment in an attempt to hide her car and body underwater, but the fisherman's DNA was not found on the trunk or back bumper among other indications that someone drove the car down the embankment. None of Carver's or Cassada's DNA was found on Yarmolenko's body or on the ligatures. Prosecutors theorized that the killers' DNA had washed away from the ligatures, but the ribbon with delicate shredded ends showed no evidence of having been underwater, even though Yarmolenko's body and clothing were wet. The defense countered that in addition to the ribbon being dry, a partial washing, leaving one man's DNA but not another's, would have been impossible. Read more about the DNA on the ligatures on our DNA page. For people who are unfamiliar with the suicidal risk factors in Yarmolenko's history, it seems astonishing that she could have persisted in multiple attempts at suicide. So many chances were given her for a change of heart: the car stopped short of the river, drowning was unsuccessful, two ligatures were tied before she fastened the bungee cord. Yet, evidence that conflicts when viewed as a murder fits together when viewed as a suicide. This website exists to put forward as comprehensive an overview of the case as possible, and for that reason we must address the evidence that supports the suicide theory. Watch the suicide theory reenactment below. Bolton SL, Sareen J. Sexual orientation and its relation to mental disorders and suicide attempts: findings from a nationally representative sample. Can J Psychiatry. 2011 Jan;56(1):35-43. PubMed PMID: 21324241. King M, Semlyen J, Tai SS, Killaspy H, Osborn D, Popelyuk D, Nazareth I. A systematic review of mental disorder, suicide, and deliberate self harm in lesbian, gay and bisexual people. BMC Psychiatry. 2008 Aug 18;8:70. doi:10.1186/1471-244X-8-70. Review. PubMed PMID: 18706118; PubMed Central PMCID: PMC2533652. Find us on Twitter @FreeMarkCarver. The North Carolina Center on Actual Innocence is representing Mark Carver and depends on grants, donations, volunteers and programs like Amazon Smile, Goodshop and Giving Assistant to help support its non-profit work. This website is privately owned and is neither affiliated with nor endorsed by NCCAI. Content Copyright 2012-2019 Free Mark Carver, all rights reserved. Powered by Drupal.